June | 2014 | Namaste to you, Sir! It’s Summer, (or Spring, I’m never sure) and normally people don’t have soup during these months, unless it’s cold soups, which to me are just plain wrong. Except for Gazpacho. Gazpacho is completely right, I love gazpacho!! And for that anomaly, I blame Catalunya. Catalunya and Almodovar. It started as a lovely day, so we decided to go for breakfast at the Hill Bakery. We had only been seating there for twenty minutes when all of a sudden buckets of water descended on Richmond Hill washing everything and everyone away. People had to leave their coffees and half eaten cakes and look for shelter. 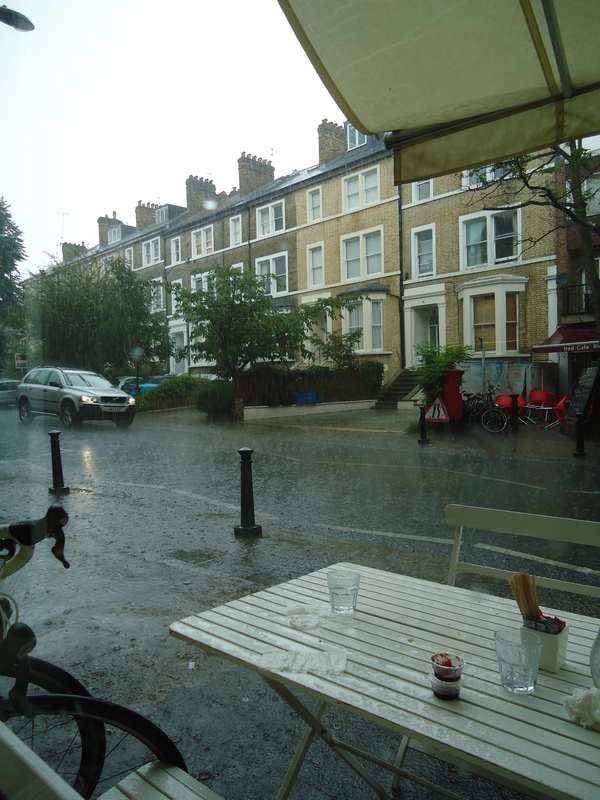 Luckily we were comfortably seated by the window, enjoying the best of two worlds: still getting sunshine (until it started to rain) but protected from the treacherous London weather. 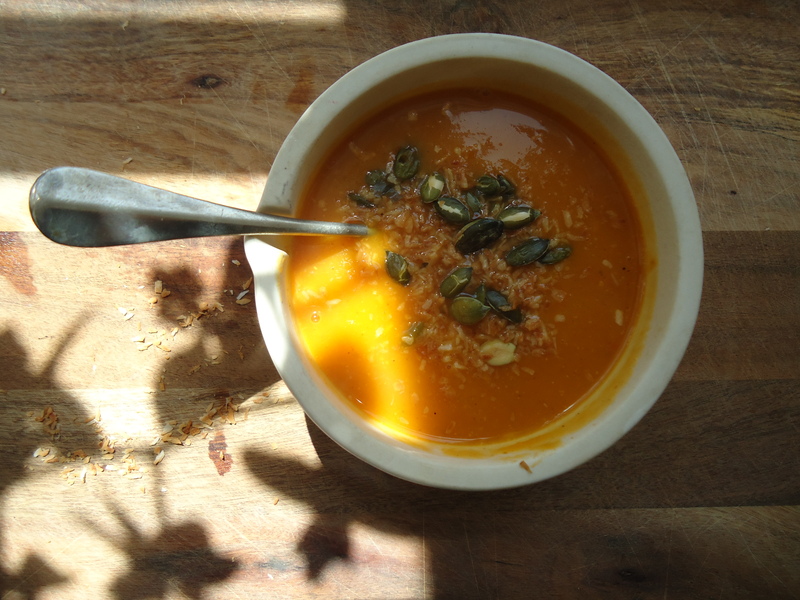 On days like this I like to make either carrot or butternut squash soup. 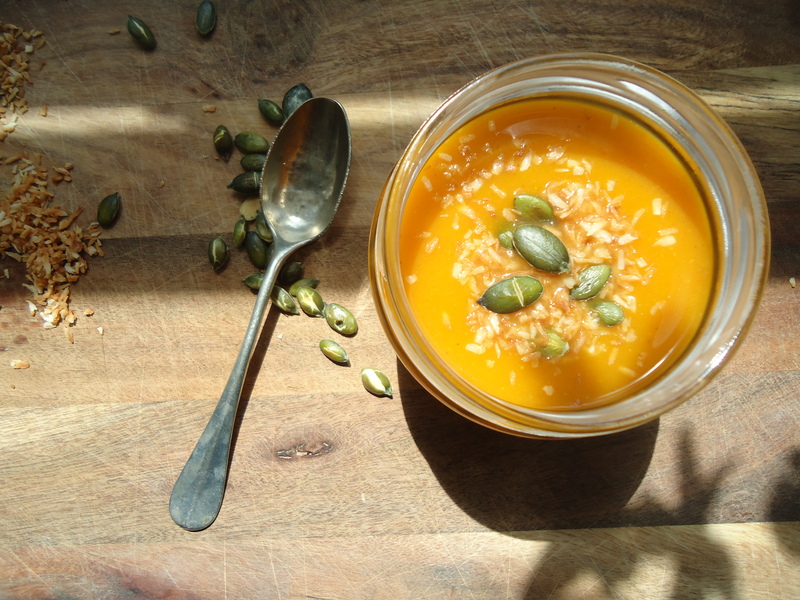 I discovered recently that by adding a topping of toasted coconut and pumpkin seeds my sweet butternut squash soup turns into something completely different, a bit like adding accessories to a beautiful but plain dress. But I digress, it happens every time I listen to Joaquin Sabina: it’s like poetry walks into my room and hits me in the head with a bag full of images and metaphors… Quite distracting. 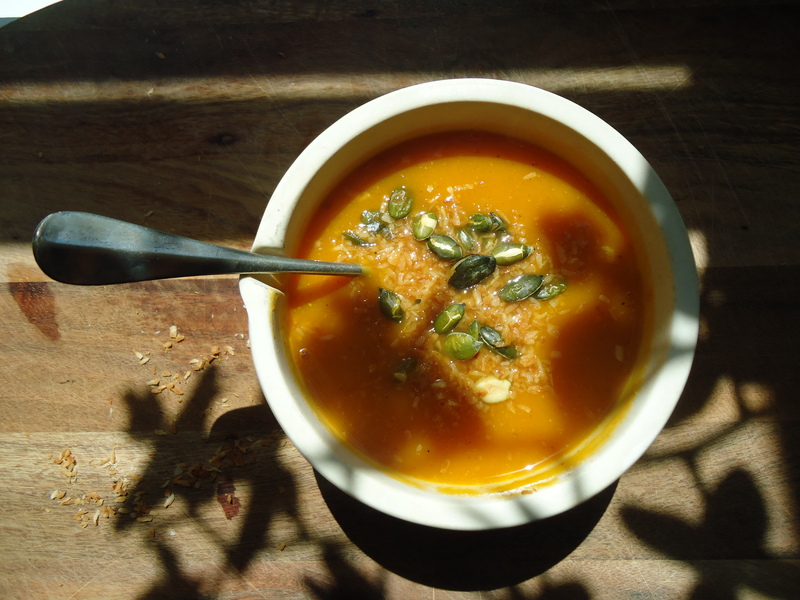 Specially if you are writing about soup such an un-poetic meal and yet… and yet…there is poetry in soup, is there not? Something to do with home and warmth and the beauty of simple things. If I could choose to come back as any musician, as the author of any songs in the world, I’ll choose his. There is something so wonderful, in the way he uses language as a paint brush to conjure up complex images with just a couple of words. A whole story in a line. I know, I know, you don’t want to read about musicians, you want to read about soup! Well, if you try this one you won’t feel disappointed. It is also so easy to make! 1 butternut squash. Peeled (the easiest way to peel it is using a potato peeler. A Dad trick that works like magic). 1/2 a big onion or a small one. 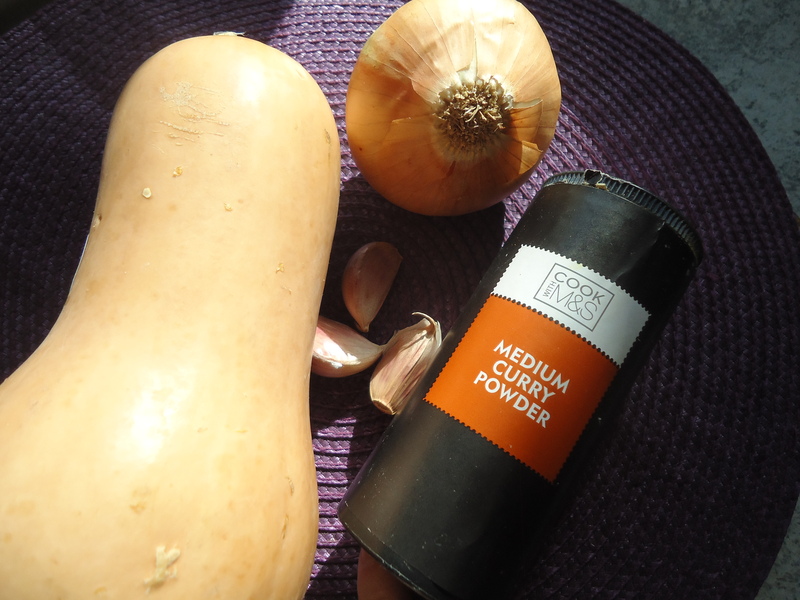 1 heaped teaspoon of curry powder. 1.- Chop the garlic and the onion. Dice the butternut squash. 2.- In a pot at medium heat add the oil, then the spices. Let them heat for 1 minute, so that they release all their flavour (this technique is called Blooming and you can read about it here and learn all about helping your spices come alive). Be careful for they burn easily. 3.- Add the chopped garlic and onions to the pot. Let them cook until the onion goes translucent. 4.- Add the butternut squash, salt and pepper and cover with water. Let it cook for about 40 minutes, until the butternut squash is soft. 5.- While the soup cooks, you can prepare the topping. 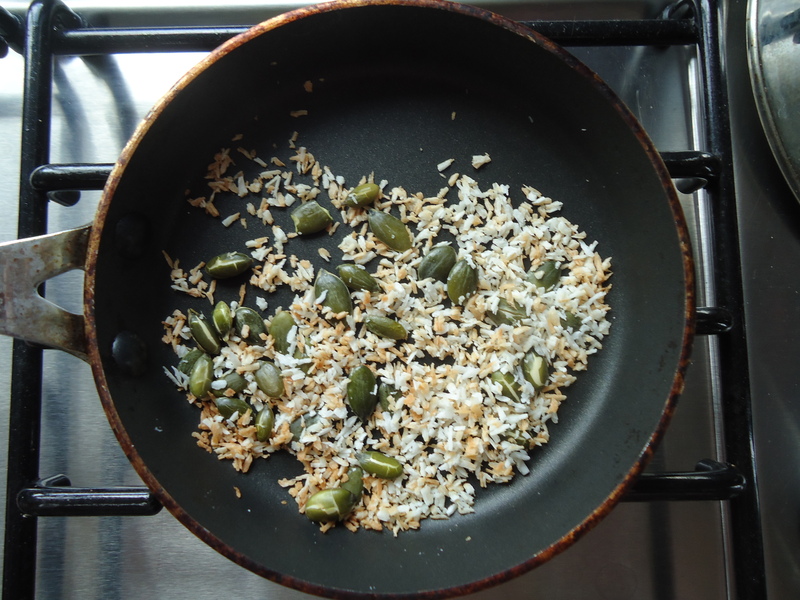 In a pan place the pumpkin seeds and toast for 1 minute. They have a tendency to pop a bit like popcorn, so be careful. You can add the coconut as soon as the first seed looks toasted. Coconut takes only a few seconds to brown. Set aside to use when serving the soup. 6.- Once the soups is ready, blend until smooth. If your soup is too thick, add a bit more water. 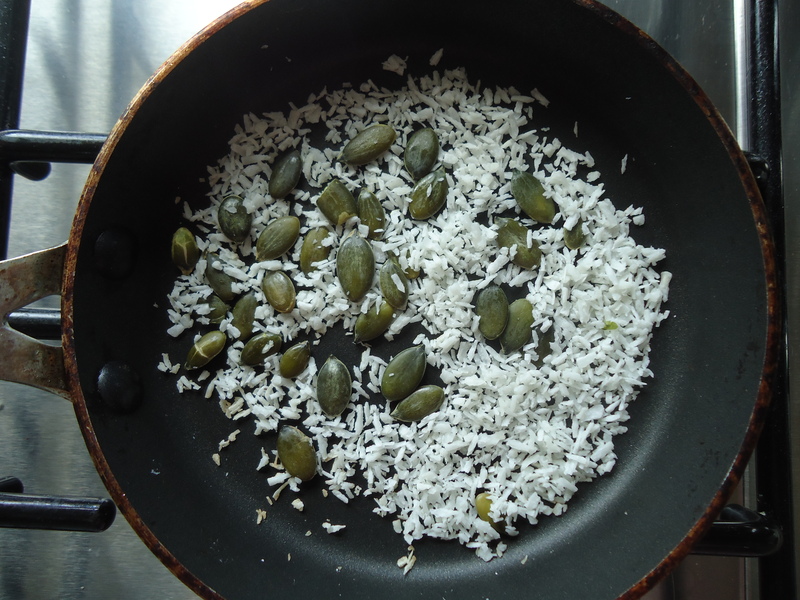 Serve with a sprinkling of coconut and pumpkin seeds. 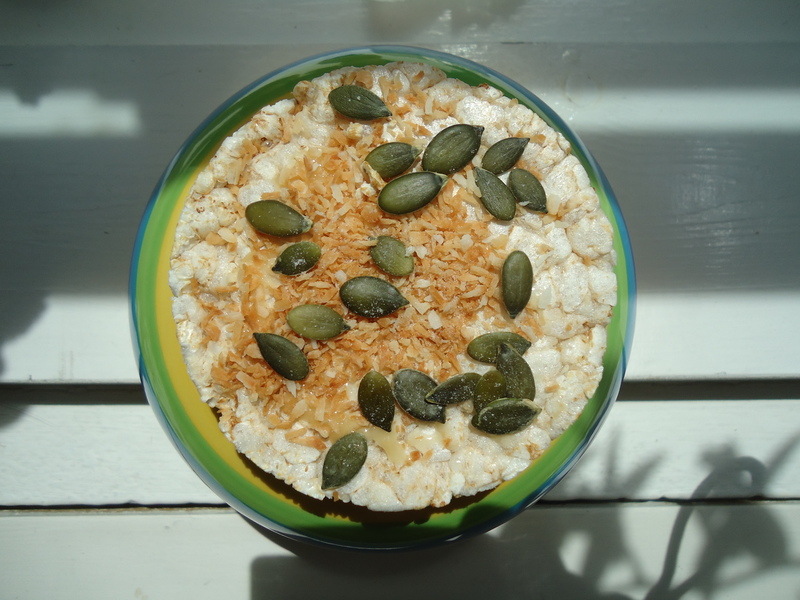 Another way to enjoy the topping (highly addictive though) is by spreading a bit of honey or a nut butter on a rice cake and then sprinkling the coconut and seeds. Finish with a bit of Himalayan salt. A delicious snack for any time of day! (or so I tell myself). 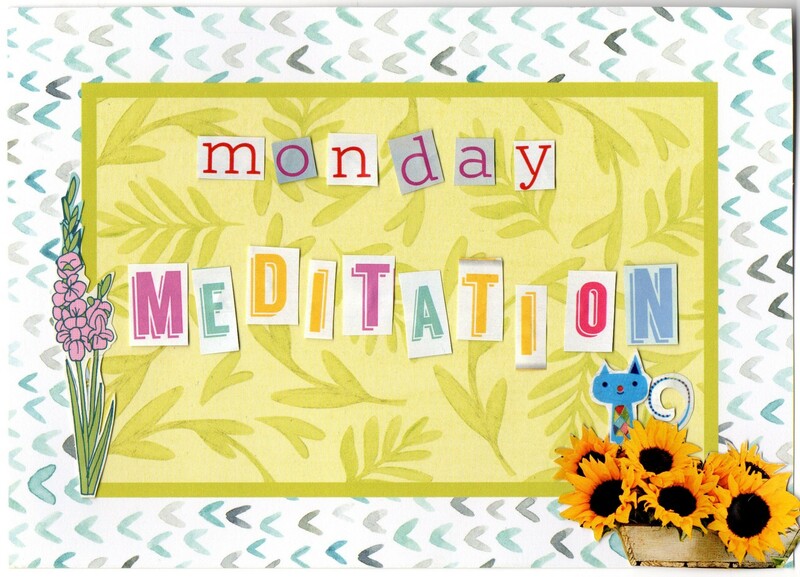 The purpose of meditation is to be able to quiet the mind, not by making our mental chatter stop, but by allowing us to contemplate our every day thoughts as a spectator rather than engaging with each and every one of them as we normally do. By getting some distance from our thoughts, we gain objectivity and a new sense of balance. In due course, our creativity increases: as our mind stops being focused all the time on the same subjects, there is an opening in our thoughts, a space for something new to be born. 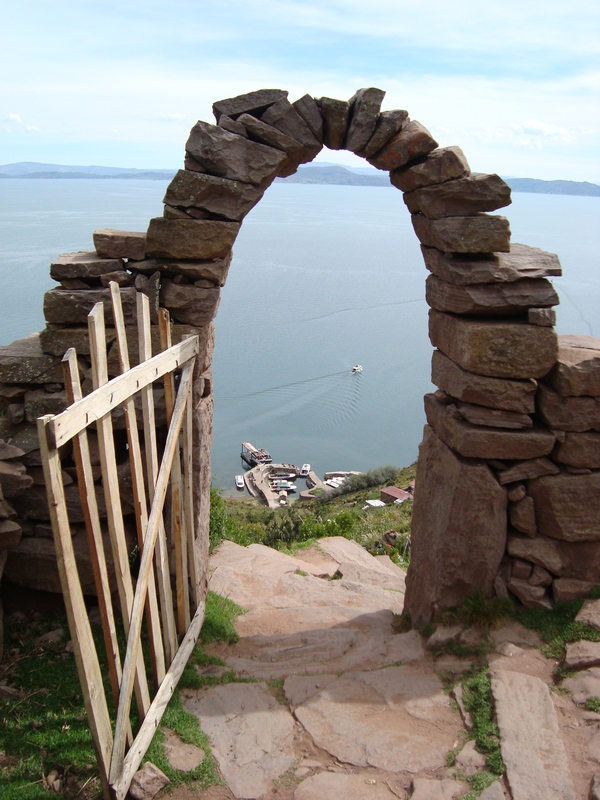 Meditation opens the door that connects us to our intuition, inner guidance and creative self. A lot of people are closed to the idea of meditation because stress makes them restless and so they feel they won’t be able to sit still for any given period of time. However, meditation doesn’t always require stillness. And when our mind is particularly restless, a movement meditation might be even more useful for us. So, what is a moving meditation or movement meditation? It is no more than what its name suggests: meditation that involves movement. One of the most common ones is walking meditation; an exercise that involves pacing with your mind focused on your movements, your breathing and the way your body feels. It’s an easy way to disengage from the mind’s chatter by focusing on the body. The meditation in this post involves a series of movements and the singing or chanting of a mantra. Mantra is a Sanskrit word which means “Sacred utterance”, it is a sound, word or group of words that are used to aid concentration during meditation. Which are the benefits of this type of meditation? 1.- If your mind is scattered, having to focus on the movement and the mantra will force it to forget about everything else: there is no way you’ll be able to concentrate on singing and moving and also have space to think about any worries you might have. As soon as your mind wanders off you’ll lose track of the song or the movement, and therefore will be able to bring yourself back to the meditation. During traditional meditation if you get caught up in your thoughts, it might take you a while before you notice it, in this one, you’ll be aware as soon as it happens. 2.- It is a great way to start your morning, as the gentle movements will wake your whole body up and get you ready to start the day. 3.- Mantras have different meanings, some of them are about gratefulness, some about asking for peace and balance, by repeating them, we are also getting connected to this energy of balance and gratefulness. 4.- This meditation has also all the benefits of traditional meditation. It’s a mantra that dispels doubts and opens us up to receive guidance and protection. You can find many more of their videos on Youtube, with different mantras and movements.